Andrew Watson, whose talks offer strategies for studying and teaching, returns to the Williston Northampton School this week for special sessions with the faculty and students. In his presentations, Mr. Watson, of Translate the Brain, combines news about modern neurological studies with tips on how that information can translate into practical, every day applications. Last November, Mr. Watson was warmly received when he spoke at the Upper School assembly. In his talk, “How to Study Less and Learn More,” Mr. Watson had students play a numbers game with a surprisingly easy solution. He then offered similarly straightforward ways for students to get better grades while doing less work, such as ways to learn, forget, and relearn the material; focus on the task at hand; and get enough sleep. He will give a similar talk to Upper School students on Friday, September 25 at the 8:30 a.m. assembly. At the all-faculty meeting the night before, Mr. Watson will speak about motivation with an emphasis on stereotype threat. Mr. Watson’s presentation will include references to the work of Carol Dweck, professor of psychology at Columbia University, who’s work focuses on the role of motivation in education. The snack bar at the StuBop will be opening later this week, as the dining services are planning some new items to be served and they need time to prepare for the new offerings. We will be sending more information about this during the week. Everyone enjoy the first day of classes! Next Week – Daylight Savings! Just a heads up to everyone that we “fall backwards” one hour this coming Sunday morning with our clocks– gaining an additional hour of sleep! In order to adjust to the shorter days ahead, the schedule below (“cut and pasted” from Special Schedules) will go into effect for the last week of the Fall Afternoon Program. Our fall season is quickly slipping away! Varsity Volleyball was able to raise well over $2,000 due to the support of the Williston community. To everyone that came out – you were an amazing crowd! While I’m coaching, the focus is on the court. But when I turned to see what a player was smiling at during a time out, I was amazed at the turnout! Now that you know how much fun volleyball games are, we’d like to see you fill those stands more often!!! Didn’t get a t-shirt and still want one? Shoot me an email with your shirt size. These will be CASH ONLY sales. $15. And again, thanks to YOU – WILLISTON!!!!! Varsity Volleyball is doing a fundraiser called DIG PINK®. DIG PINK® is part of the Side-Out Foundation which is devoted to Cancer Research. Here is the link to our campaign. Please check out the site and donate. We will be selling a limited number of DIG PINK® t-shirts in the upcoming weeks. On October 18th at 5:30, we have a night game against Worcester Academy. Our goal is to have everyone in the stands wearing DIG PINK® shirts or pink t-shirts. We will have other fundraising aspects to come on campus. We’ll tell you more about them in assembly. Please donate! If we get enough money, our coaches, Ms. Chambers and Mr. Rutherford, and manager, Mikey Lloyd, will be sporting new hairdos. Details to follow! Oliver Demers ’14, Gia Parker’14, Nick Pattison ’14*, Maddy Stern ’14*, Michael Walters’14, Colin Brown ’15, Brittany Engelman ’15, Terrance O’Brien ’15*, Emmett O’Malley ’15*, Julia Valine ’15*, Amelia DeFrancis ’16, Connor Murray ’16, and Rachel Rockwell ’16 (starred students are returning members of the DC). On the last day of the year the Fiber Arts Club left their mark on the lion. 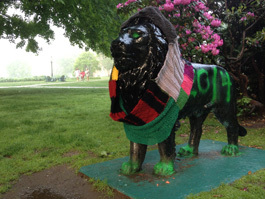 Instead of painting the statue, club members “yarn bombed” him with a multi-colored scarf. Perling, basket weave, knitting, and cable stitch are all visible in the scarf, which is more than 50 inches long. She said her thanks go out to Fiber Arts Club members Nick Pattison ’14, Yuwei Cao ’16, Alex Peng ’13, Amelia DeFrancis ’16, and Brendan Shaeffer ’16 for their great effort this year! It is my pleasure to share with you that Charlene Cross, our toddler teacher and the Assistant Children’s Center Administrator, and Keira Durrett ’88, our Children’s Center Director, were both recognized by the Massachusetts Department of Early Education and Care for their outstanding work. Each year the Massachusetts Department of Early Education and Care gives out awards to exceptional educators and leaders in the field of early childhood education in each region of the state. 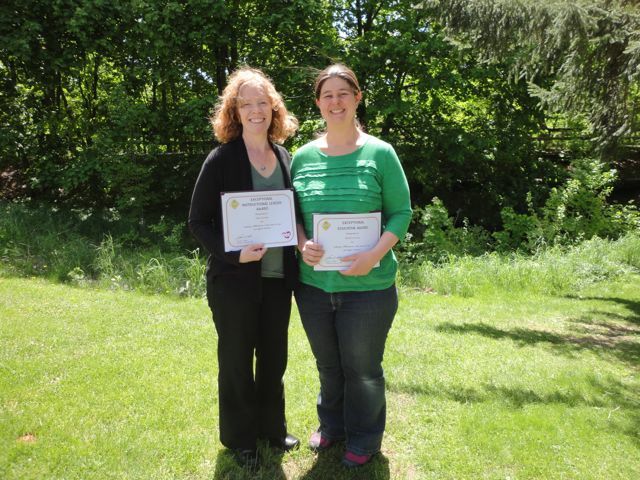 I am proud to announce that Charlene has won the Exceptional Educator Award and Keira has won the Exceptional Leader Award. These awards are for Region 1 in the state which includes Hampden, Hampshire, Franklin and Berkshire Counties. Congratulations to Charlene and Keira on this fantastic achievement! I hope you will congratulate both of them when you see them on campus—this award comes as no surprise, but it’s a testament to the work they do and the passion with which they do. 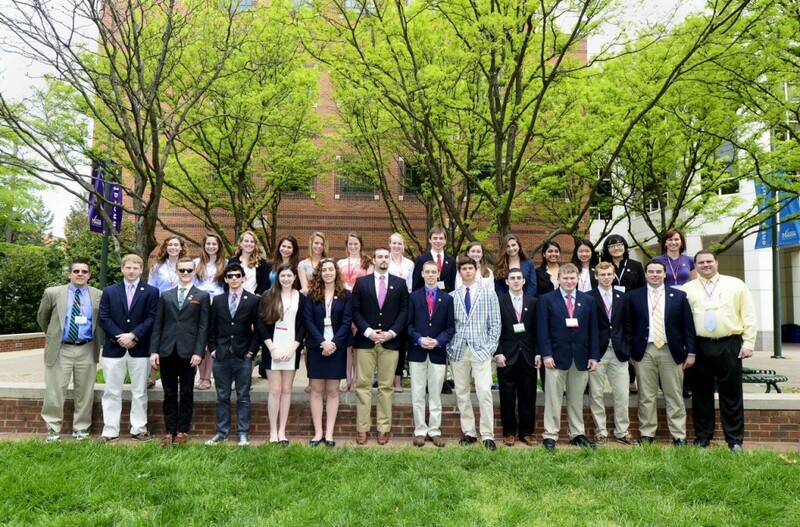 Editor’s note: AP US History classes participated in the We the People program from April 26-30 at George Mason University in Washington, D.C. The following is an update from history teacher and trip leader Peter Gunn. What a great start! Despite some travel and other sequester-related challenges on Friday, we did tour the Supreme Court and the King, FDR, and Jefferson Memorials – many inspiring moments. For me, the highlight was viewing the actual letter between Clarence Earl Gideon and the Clerk of the Supreme Court. While many believe that “due process” is the bedrock of civil liberty, Mr. Gideon’s struggle shows me that a deep and persistent belief in your own rights is the vital element in civil society. In 1939, The Willistonian conducted a poll to decide Williston’s nickname. Now, almost three-quarters of a century later, The Willistonian will conduct a second poll to vote on the official design of the Williston Wildcat. Since the Wildcat is a common team mascot used by many schools, “we want people from both within the community and outside, to say, ‘hey, that’s the Williston wildcat!’”, says Athletic Director Mark Conroy.